It’s 2087, 75 years after the start of the final war. It lasted 15 years and left the world devastated. It hasn’t rained for 50 years. Lost Wells is a settlement in the desert that actually has water. The peaceful villagers welcome Derek Abernathy (Adam Ant) and his cult followers. Abernathy immediately massacres and enslave many in the settlement. Ethan (Bruce Dern) rises to challenge him. 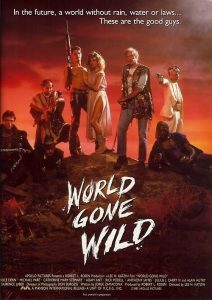 Ethan takes school teacher Angie Banning (Catherine Mary Stewart) to the big city and find a barbaric world desperate for water. Ethan recruits his old partner George Landon (Michael Paré) and others to battle Abernathy’s cult. This takes the style of ‘Mad Max 2’ even including the white outfits. They’re throwing hubcaps like the boomerang. The plot is pulled from ‘Seven Samurai’ like many other movies such as Steve McQueen in ‘The Magnificent Seven’. However it’s nowhere near the same vision or quality. Adam Ant is not the most imposing villain but he fits the low quality camp. I always like some Catherine Mary Stewart and Bruce Dern is one of the great actors of our times.